This towel you'd stitched looks great& the saying you chose is awesome too.Sure it will make a lovely gift. Flowers for everyone.Thanks for sharing your efforts& God bless you as you celebrate the 4th too. Just wanted to let you know, she loved this towel and has asked me to make her 3 more just like it for her three children as gifts for her children! Such a good verse, would be nice for a kids room too. sometimes words or letters pucker,this is perfect. Thanks - it was a nice design to stitch!! Thanks bunches, Carolyn!! Hugs to you!! Made me smile. Stitched well. I hope she smiles when she sees it!! Thanks bunches!! Wonderful lovely job, and thank you for sharing where you found your design..
Beautiful work , Laura and so true! Love it.. I agree with the others. It would be perfect for a bathroom wall hanging! Next time I do this design - I am tempted to frame it!! Thank you!!! Love the Towel. I don't think anyone could be offended with this saying. Thank you - I certainly hope not!! Hugs to you! Fabulous! 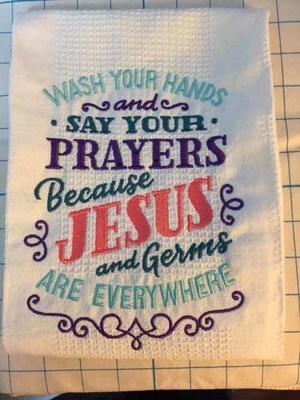 I think putting it on a towel is just perfetct. I did this on a wall hanging for the bathroom. Everyone laughs their heads off! Oh, a wall hanging is perfect - I may do that for my own guest bathroom!! Thanks for the great idea!! Hugs to you!!! Laura, this is a lovely towel.....love the words and it is so true! Thanks Vicki - my friend is a very southern girl who told me it made her laugh so!! I hope it doesn't offend anyone!! Thanks!